The city of Centropolia is a battlefield. Superheroes and villains are nuking it out in the town square, down by the river, on the airport. At least maybe, we don’t actually know where they are fighting. But fighting they are, somewhere in Centropolia, for nothing less than total control of the city. A battle like that is not decided in one fight, between one hero and one villain with their respective sidekicks – a battle like that goes on for years and crosses over into parallel universes and alternate timelines, superhero comics have taught us that much. A battle like that lasts at least three rounds, because that’s the minimum you need to have the five victory points that win a standard game. The setting sounds like a game that everyone should be able to enjoy. Even with heroes with silly names like The Glacial Torch and Grizzlyman beating on villains like Angerprone and the Sabertooth Ninja. Because, really, silly names are part of the whole superhero gig. Just ask The Elongated Man, Moon Knight or Typeface (yes, really). Suddenly, Grizzlyman is starting to sound quite reasonable. The problem with Battle for Supremacy doesn’t lie in the silly names, nor in the tidbits of backstory some hero and villain cards display. Honestly, you’d be hard-pressed to come up with backstories more daft than DC and Marvel have already. The problem with Battle for Supremacy lies in the way you fight. Stand back! I’m going to do Science! Like I said before, the battle for Cetropolia rages over multiple rounds, each with a new pair of villains fighting a new pair of heroes. Each character takes some time to prepare an attack, which he then unleashes onto an enemy, causing damage. And then the same happens again, until one team is down for the count. 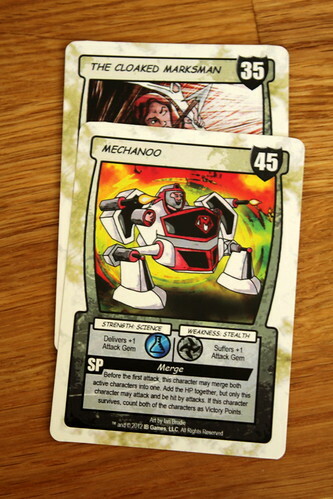 To prepare an attack, you play attack cards onto your team members. There are four different types of attack: Brutal, Science, Elemental and Stealth. The cards all represent different named attacks, but it’s only the type that counts. Once you started preparing an attack with a character, you can only play cards of the same type there. Since you only have two heroes, that means only two of the four attack types will be useful for you at any given time. No stealthy, brutal, elemental attacks here, once you’ve committed on an attack type, that’s the way to go. Or you abort the attack and start again, but then you lose all the cards previously played and cannot do anything else on that turn. So the epic contest, the battle of the ages boils down to: who can draw three cards with the same type the most quickly. Of course, sometimes you draw a Shield card that lets you defend yourself. Playing a Shield lets you remove an attack card from an opposing hero. But since you only play one card on a turn, it doesn’t give you a real advantage over your opponent, either – you can only hope he doesn’t have enough cards of the right type to finish his attack now. Oh, and then there are Special Powers, of course. Some heroes and villains have them, and each can be used exactly once. They have various degrees of usefulness, but in the end you can use them all only once. One fight lasts an average of eight to ten rounds, so once your power is used your heroes spend the rest of the fight tossing rocks at each other. Oh yeah, we actually wanted to damage our opponents with all that. Whenever you finish preparing an attack, you unleash it on the enemy of your choice, dealing one Attack Gem of damage. If the attack type matches your heroes Strength, you add one more attack gem. The same goes for attacks matching the opponent’s weakness. When the stars align, that gives you three attack gems in one punch – but there’s very little you can do to make that happen, all you get are random card draws, after all. Each Attach Gem is worth five Hit Points, a character with enough gems on him to match the hit points printed on the card is knocked out. That is the only purpose of hit points in the game, so why did we have to multiply by five again? Once your characters are the only ones left standing, you receive a victory point for each of your guys still standing. Executing an attack also causes all players to discard their prepared Attack Cards, so every punch is the same process of playing three cards of the same type again. At least that gives you a small tactical decision to make: you might want to keep a set of matching cards in your hand when you know you won’t be able to use them. The time-honored superhero strategy of being punched in the face in order to save the world later. I believe Superman invented that one. But that’s almost the only decision to make in Battle for Supremacy. Other than that, you’re strategically drawing random cards and hope they match the ones you’re trying to play and once in a while decide to use a Special Power. I’m really sad the game turned out to be the draw-and-play card game luck frenzy that it is, I do like the setting and with some further thought and additional options to act it could have been a light but fun game. Especially the game with three or four players could have been much more interesting, with the options to team up on the current leader and do other healthy, team-building activities. But in the end, you still have to beat each other up before the round ends, and the former leader has to idly sit by after his characters were destroyed. 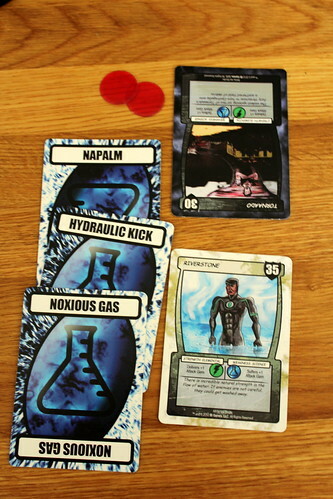 No matter what we tried, we didn’t have as much fun playing Battle for Supremacy as we should have had with a superhero beat-down card game. It didn’t help much that the game made me feel old, either: the Special Powers on the card are in small enough type that I wished I had a pair of reading glasses, for the first time in my life. At least other than that, we didn’t find anything to complain about in the components. This was the first The Game Crafter print-on-demand game that we got to test, and the quality of the card stock as well as the print quality was very nice, I can’t say anything about longevity just yet, but they don’t seem the type that falls apart while shuffling after a couple of games. Unfortunately, good components don’t make up for dull gameplay that doesn’t let you make decisions – or they’d have to be exceptionally good components – and Battle for Supremacy really needs to do something about that before it’s ready for prime time. The Plains of Triangles. Undiscovered land. With nothing but a cart full of milestones and a group of builders we set out to bring civilization to the uninhabitet land. We’re not really going anywhere, but we put the infrastructure in place for the people that come after us, that will settle the Plains of Triangles and will go somewhere.